As the back-to-school season is underway, it’s important to prepare children not only for the day-to-day needs such as school supplies and clothing, but also prepare them mentally so they can best handle any psychological challenges they may face, such as bullying. Children who are perceived as different from their peers are at higher risk of being bullied. As someone who experienced excessive bullying throughout my school years, I know this all too well, first-hand. Of young people, 70.6 percent say they have seen bullying in their schools. And only about 20 to 30 percent of students who are bullied notify adults about the bullying, which only exasperates the problem, leaving it unaddressed. The victims are not the only ones who suffer long-term effects, bullies are also at higher risk for mental health problems and other struggles in childhood. 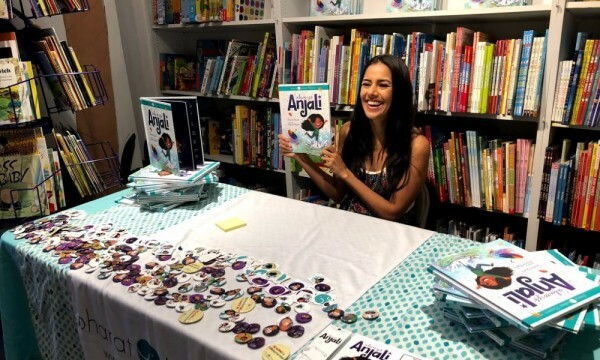 Actress Sheetal Sheth recognized the importance of addressing this issue at an early age and talking to kids in a way that’s accessible and non-didactic. “I wanted children who felt different for whatever reason to be able to celebrate those things and not be embarrassed by them,” says Sheth. She did exactly that when she authored a children’s book titled Always Anjali, which teaches kids to appreciate what makes them special and honor their differences. She adds that it’s important for children to engage in thought-provoking conversations. Questions such as ‘Why does Anjali get singled out?’, ’How does that make her feel?’ or ‘How would you step in and help Anjali in this situation?' are critical to their development and shaping their outlook. In order to eliminate, or at least reduce the negative impacts of bullying, it’s of utmost importance to talk to children about this behavior and how to handle it at an early age. “I think you're never too young to talk about anything. Obviously the manner in which we discuss and the language has to be appropriate, but I truly think the world is in such disarray because we aren't equipped to communicate well. It seems productive, open conversations are increasingly rare. Also, kids say mean things. And sometimes don't even know they are doing it. Teaching our kids empathy is one of the most important things we can do for them. And then to talk about what to do in these situations,” she says. When Sheth first talked to her own daughter about anti-bullying, her daughter was already aware of what teasing is and that's it's wrong. Like most children, she loved being part of a 'grown up' conversation. “I try to make it into something fun where we act out different scenarios. When I go through the book specifically, I talk to her about the images,” shares Sheth. She emphasizes that representation matters. Not just in seeing someone that looks like you, but the narratives behind it and stories told from authentic voices. In her quest to teach her own daughter the importance of embracing our individuality and our different cultures, Sheth has been part of a larger conversation and able to bring that message to children everywhere.